Ablate — Eliminate tissue around the pulmonary veins or at other sources of erratic electrical signals that cause the irregular heartbeat. Ablation — A procedure that eliminates tissue around the pulmonary veins or at other sources of erratic electrical signals that cause the irregular heartbeat. Amiodarone — An antiarrhythmic medication used for atrial and ventricular irregular heartbeats. It is considered the most effective antiarrhythmic drug, but can cause serious side effects, including thyroid damage, liver problems, or kidney problems or failure. Other possible side effects include lung and breathing problems, respiratory distress, vision problems, diaphragm paralysis, nervous system damage, severe hair loss, speech loss, cognitive problems, and death. Oral dose amiodarone has many brand names that differ in various countries. Brand names in the US are Cordarone and Pacerone. Angina — A pain usually felt in the chest that happens when part of the heart does not receive enough oxygen through the blood. For more information, see: What Is Angina?. Angiotensin II — A hormone in the blood that constricts blood vessels, which can cause blood pressure to rise and force the heart to work harder. Angiotensin-converting enzyme (ACE) inhibitors — Medicines that help relax the blood vessels. ACE inhibitors are used to treat various conditions such as high blood pressure, heart failure, and migraines. For more information, see ACE inhibitors. Many brand name ACE inhibitors are available in the US, including Capoten, Vasotec, and Prinivil. Angiotensin II receptor blockers (ARBs) — Medications that lower blood pressure and allow the heart to pump blood more easily. For more information, see ARBs. Brand name ARBs include Avapro, Cozaar, and Diovan. Antiarrhythmic drugs — Medication used to convert from atrial fibrillation to normal sinus rhythm, and to maintain it. Also called rhythm control medications. For more information, see Rhythm Control Medication for Atrial Fibrillation. Anticoagulant — A medication that reduces the risk of stroke by decreasing the chances of blood clot formation. Examples include warfarin (Coumadin), dabigatran (Pradaxa), rivaroxaban (Xarelto), and apixaban (Eliquis). Anticoagulant medications are sometimes called "blood thinners" because they make it difficult for blood to clot. Anticoagulation — Use of an anticoagulant medication, frequently called a blood thinner, to prevent an afib-related stroke. Antiplatelet drugs — Medication used to decrease the risk of heart attacks and certain strokes, and to treat artery blockages in the legs. These drugs work by preventing a type of blood cell called platelets from clumping together to form clots and thus help prevent heart attacks and strokes. Antiplatelet drugs include aspirin, clopidogrel (Plavix), ticagrelor (Brilinta), and ticlopine (Ticlid). Although aspirin has been used for stroke prevention in atrial fibrillation, it is no longer recommended for that purpose. For more information, see Expert Consensus Statement Recommendations Released: Assessing Atrial Fibrillation Stroke and Bleeding Risk for Appropriate Anticoagulant Use. Antithrombotic drugs — Medications that help prevent blood clots that could cause stroke, heart attack, or other damage. The two primary types of antithrombotic drugs are anticoagulant drugs and antiplatelet drugs. Anterior — The front of the heart. Antrum — The base of the pulmonary veins, which includes the posterior (back) wall of the left atrium and extends to the anterior (front) of the right pulmonary veins. In essence, it is a wide perimeter around the pulmonary veins. This area became the target for ablations because of issues with ablating the ostia. Antrum Pulmonary Vein Ablation — A type of catheter ablation where lesion lines are placed in the antrum (base) of the pulmonary veins, which includes the posterior (back) wall of the left atrium and extends to the anterior (front) of the right pulmonary veins. Doctors do not confirm conduction block in this ablation. For a procedure where conduction block is confirmed, see pulmonary vein isolation. Apixaban — An anticoagulant medication that is a factor Xa inhibitor. Because apixaban (brand name Eliquis) works by a different method than warfarin, it offers an alternative to warfarin for those who have nonvalvular atrial fibrillation. It was the third of the new and novel anticoagulants to be approved in the US. For more information, see: Apixaban Superior to Warfarin for Atrial Fibrillation Stroke Prevention. ARISTOTLE Study — A large international study designed to see which drug, apixaban or warfarin, worked more effectively to prevent strokes while minimizing bleeding in patients with atrial fibrillation. For more information, see the ARISTOTLE Study results at Apixaban Superior to Warfarin for Atrial Fibrillation Stroke Prevention. Arrhythmia — See cardiac arrhythmia. Asymptomatic — Afib episodes that the patient does not feel or for which there were no symptoms. Atherosclerosis — A disease of the arteries characterized by the buildup of a waxy plaque of fatty material, such as cholesterol, on the inner walls of the arteries. This form of heart disease is also called "hardening of the arteries." Atrial remodeling — Changes in the deeper layers of heart tissue (substrate) or the way electricity is conducted within the heart, which can occur when atrial fibrillation is untreated and/or when afib progresses to persistent or longstanding persistent atrial fibrillation. This is also known as substrate modification. It is more difficult to treat afib once atrial remodeling has occurred and means that pulmonary vein isolation by itself is unlikely to stop atrial fibrillation. More extensive ablation techniques are typically needed and procedure success may be lower. Atrial volume — A measure of how much blood fills the left atrium during the cardiac cycle. Atrioventricular (AV) node — The part of the heart that sends electrical signals from the upper to the lower chambers of the heart. See it in this diagram of the heart. Atrium — An entry chamber on either side of the heart that receives blood from the veins and pumps it into a ventricle or ventricles. To learn more, see: Atrium. AV junctional ablation — See AV node ablation. AV node ablation — A procedure in which the AV (atrioventricular) node is frozen or cauterized to stop electrical signals from being transmitted and a permanent pacemaker is implanted to control the heart's electrical system. This procedure doesn't stop the afib, and while some patients no longer feel their afib, many still do, and patients may still feel tired. The patient must remain on an anticoagulant due to the risk of stroke. This is usually a procedure of last resort for those elderly who are too frail for other procedures, or for those for whom all options have been exhausted. Also called AV junctional ablation. Balloon catheter — This type of catheter is inserted into the left atrium and the electrophysiologist inflates the balloon at the tip of the catheter. Balloon catheters can ablate a larger area of tissue than single point radiofrequency catheters, which enhances the prospects that lesions will be contiguous (without gaps) and could shorten procedure times. There are balloon catheters using cryothermy, laser energy, and even radiofrequency energy. Bayesian-designed clinical trial — A type of clinical study that is used to test the safety and efficacy of a treatment or device by setting performance goals, or endpoints, estimating how well it will work and measuring patients' test results against those preset goals instead of comparing them to a control group. For instance, a Bayesian-designed clinical study may have an effectiveness endpoint that assumes that over 70% of patients enrolled in the trial will be free from atrial fibrillation at 12 months. If at least 70% of the patients in the study meet this goal, the study will meet the effectiveness endpoint; if fewer than 70% meet it, the trial will not meet the endpoint. Beta blockers — A type of medication that blocks adrenaline and slows heart rate, lowers high blood pressure, and relaxes blood vessels to improve blood flow. For those with atrial fibrillation, beta blockers are used for controlling the heart rate, though they generally don't stop the atrial fibrillation. Beta blockers are also used to treat high blood pressure, various heart conditions, glaucoma, migraine headaches and other conditions. For more information, see: Rate Control Drugs and Beta Blockers. Bipolar radiofrequency energy — Bipolar simply means that the radiofrequency energy is transmitted from two places to a single target. Bipolar radiofrequency energy generates lower power and creates lesions that are less deep than unipolar, but since bipolar radiofrequency energy is sent to different sides of the tissue (top and bottom), high temperatures aren't needed. This is sometimes called "phased RF". Blanking period — The three-month period of time following an atrial fibrillation procedure in which atrial fibrillation episodes can occur as part of the body's healing response. Any afib activity during that blanking period is not counted in a study's results and is not used in determining success or failure of the procedure. Blind study — A blind study is a trial in which the participants are unaware of whether they are in the study's experimental group or control group. Blocked — See conduction block. Blood pressure — The force with which blood pumps through the arteries. See also high blood pressure and hypertension. Calcium channel blockers — A type of medication that can relax the blood vessels and reduce heart workload by keeping calcium out of cells in the heart and blood vessel walls. Some calcium channel blockers are used for atrial fibrillation because they help to reduce and control heart rate. Calcium channel blockers are also used to treat other conditions such as Raynaud's disease, angina, and migraines. For more information, see: Rate Control Drugs and Calcium Channel Blockers. Cardiac arrhythmia — An abnormal heart rhythm. There are many types, but atrial fibrillation is the most common cardiac arrhythmia. Cardiac cycle — Describes the process of de-oxygenated blood flowing into the right atrium, which contracts and pushes the blood to the right ventricle. When the right ventricle contracts, blood is pumped through the right pulmonary artery to the lungs, where it receives oxygen. Blood is then pushed to the pulmonary veins, which bring the blood to the left atrium. When the left atrium contracts, blood is pumped into the left ventricle. When the left ventricle contracts, blood is pumped into the aorta, and then oxygenated blood goes to the rest of the body. The completion of this process is called the cardiac cycle. The heart, which is a muscle, relies on electrical impulses within the heart, such as those that emanate from the sino-atrial node, to tell muscles when they should contract and relax. Learn more at About the Heart. Cardiac glycosides — A type of medication that improves cardiac output but can also be toxic. For more information, see: Rate Control Drugs. Cardiac perforation — A rip or tear in the heart that can lead to cardiac tamponade. Cardiac tamponade — A potential complication of catheter ablation wherein fluid builds up in the pericardium, the "sac" surrounding the heart, and compromises the heart's ability to pump. This can be fatal if fluid is not drained. Cardiac tissue — The tissue that makes up the heart. Cardioversion — A method doctors use to convert irregular or rapid heartbeat back to normal. Cardioversion can be either of two types, electrical cardioversion or chemical cardioversion. CARTO Imaging — Electroanatomic imaging that uses magnetic technology and high resolution imaging to locate areas of abnormal electrical signaling in the heart. Catheter — A thin flexible tube that is inserted through a small puncture in the groin, arm, or neck area and threaded to the heart to ablate tissue around the pulmonary veins or at other sources of the erratic electrical signals that cause the irregular heartbeat. In some cases, a balloon catheter is used for atrial fibrillation ablation - see balloon catheter. Catheter ablation — An atrial fibrillation treatment that is done by a specialized cardiologist, called an electrophysiologist (EP), who deals with irregular heartbeats (arrhythmias). It is a minimally-invasive procedure that is generally less invasive than surgery. It is most successful in treating paroxysmal atrial fibrillation, but much progress has been made in treating persistent and longstanding persistent atrial fibrillation. It is done on a beating heart in a closed chest. Small punctures are made in the groin, arm, or neck area and thin, flexible tubes, called catheters, are inserted and threaded to the heart. Once there, the catheter's tip is threaded through a tiny incision in the wall between the left and right atria (septal wall), and is positioned to ablate tissue around the pulmonary veins or at other sources of erratic electrical signals that cause the irregular heartbeat. In some cases, a balloon catheter is used for atrial fibrillation ablation. The catheter uses an energy source, such as radiofrequency, intense cold, or laser, to create a lesion of scar tissue, called a conduction block, that stops the erratic electrical signals from traveling through the heart. Catheter ablation risks — See Catheter Ablation Risks. Catheter ablation success rates — See Catheter Ablation Success Rates. Central sleep apnea — One of the three types of sleep apnea, which is a disorder that disrupts breathing during sleep and increases the risk of having arrhythmias. This type of sleep apnea occurs when a part of the brain that controls breathing does not respond properly to carbon dioxide levels in the bloodstream. Causes may include heart failure, stroke affecting the brain stem, certain drugs, and altitude. Central sleep apnea affects fewer than 10% of middle-aged adults in the US. To learn more, see Sleep Apnea. Cerebral emboli — Blood clots that can block the flow of blood and oxygen into the brain. CHADS2 — A scoring system that may be used to determine if someone with afib should be on an anticoagulant. The CHA2DS2-VASc scoring system is now recommended by most atrial fibrillation guidelines worldwide, replacing this scoring system as the standard. To learn more, see New Stroke Risk Factors for Those with Atrial Fibrillation (AF): Female Gender, Heart Disease, and Age. CHA2DS2-VASc — A scoring system that may be used to determine if someone with afib should be on an anticoagulant. This scoring system is now recommended by most atrial fibrillation guidelines worldwide, replacing the CHADS2 scoring system as the standard. To learn more, see New Stroke Risk Factors for Those with Atrial Fibrillation (AF): Female Gender, Heart Disease, and Age. Char formation — During catheter ablation, high temperatures can lead to blood and tissue accumulating on the catheter tip. When charring occurs, only the outer layer of tissue may be ablated, which means the lesion isn't transmural. In addition, if tissue that has been charred breaks off, it can enter the blood stream and result in a stroke. Charring — See char formation. Chemical cardioversion — A treatment using medications to restore the heart's normal sinus rhythm. Circumferential ablation — A type of catheter ablation that involves lesions encircling the pulmonary veins. Some electrophysiologists also make an ablation line that connects the pulmonary veins on the posterior (back) wall of the left atrium or ablate tissue from the pulmonary veins to the mitral valve. A mapping catheter is used to identify potentials, which are areas that could serve as a trigger or a macro re-entry site for atrial fibrillation. There isn't a single endpoint, so some doctors confirm conduction block whereas others look for elimination of potentials or a reduction in electrical activity. Closed chest procedure — A procedure where the chest isn't opened by splitting the sternum (called a sternotomy), but instead the procedure is done through small incisions or ports. Coagulation — The formation of a blood clot. Comorbidity — Other diseases a person has at the same time as, or in addition to, his or her primary disease. For those with atrial fibrillation, comorbidities might include congestive heart failure, heart disease, diabetes, thyroid disease, or obstructive sleep apnea. Complex fractionated atrial electrograms (CFAE, pronounced cafe) — A site where there is an unusual electrical pattern, which could be due to the length of the electrical wave (long or short), the frequency of electrical activity (a lot or a little), or the speed of conduction (fast or slow). Complex fractionated atrial electrograms appear to represent macro re-entry sites for atrial fibrillation. Ablation of complex fractionated atrial electrograms is sometimes performed to treat persistent and longstanding persistent afib. Complex left-sided arrhythmia — A term sometimes used to refer to atrial fibrillation. Computed tomography (CT) — A non-invasive diagnostic test that uses X-rays to take pictures of organs and tissue. Concomitant surgery — Surgeries performed at the same time. For example, this could be when an atrial fibrillation ablation is performed during another heart surgery, such as coronary bypass grafting or valve replacement. Conduction block — Confirmation that a lesion of scar tissue stops the erratic electrical signals from traveling through the heart. Congestive heart failure — A condition in which the heart is incapable of pumping an adequate supply of blood to the rest of the body. Without enough blood going through the body, organs and other tissues cannot receive enough oxygen to function properly. Congestive heart failure may develop when someone is left in atrial fibrillation for a long time. Contact force — A measurement (in grams) of how much force the doctor applies to create lesions during catheter ablation. Contact force is one of the variables that affects transmurality. Contact force sensing catheters measure the amount of force applied. Contact force sensing radiofrequency catheters — Contact force sensing catheters measure the amount of contact force applied to the tissue during catheter ablation as contact force can affect transmurality. With too little pressure, the lesion doesn't fully penetrate the tissue, but with too much pressure, complications can occur. To learn more, see Contact Force Sensing RF Catheters. Contiguous lesions — Lesion lines without any gaps. Coronary artery disease — A form of heart disease where the blood vessels that provide nutrients and oxygen to the heart are blocked or narrowed. It is caused by atherosclerosis and can cause a heart attack. Coronary sinus — The vessel between the left atrium and the left ventricle. C-reactive protein — Also known as CRP, this is a protein produced in the liver as a response to inflammation in the body. An elevated CRP test result suggests inflammation is present and may be interpreted to mean that the patient is at a higher risk of heart disease. For more information, see: C-Reactive Protein. Creatine kinase (CK) — An enzyme in the heart, brain, and skeletal muscle. Elevated creatine kinase indicates muscle damage, which can include heart muscle, so doctors check creatine kinase blood levels to help diagnose heart attack and other causes of chest pain or muscle pain. For more information, see: Creatine kinase test, NIH and CK: The Test. Creatinine — A waste product in blood that is normally filtered out of the bloodstream by the kidneys. Creatinine levels are measured in lab tests as a way of checking kidney function or kidney health. To learn more about creatinine, see: Creatinine and Creatinine Test, Mayo Clinic. Cryoablation — An ablation technique using cryothermy, which is intense cold temperatures (freezing), for ablating tissue. Cryothermy — Intense cold (freezing) that is used to ablate by creating a lesion of scar tissue to stop the erratic electrical signals from traveling through the heart. Cycle — To circulate, propagate, or perpetuate atrial fibrillation. Dabigatran — An anticoagulant medication that is a direct thrombin inhibitor. Dabigatran (brand names Pradaxa and Pradax) was the first of the new and novel anticoagulants to be approved in the US. To learn more, see FDA Approves Pradaxa as Alternative to Warfarin for Stroke Prevention in Atrial Fibrillation. DCT (Dopachrome Tautomerase) — Like skin cells, called melanocytes, which make pigment, these cells make an enzyme called DCT (dopachrome tautomerase) that synthesizes the pigment melanin. Research suggests that dysfunction in these cells in the heart's upper chambers, the atria, and in the pulmonary veins connecting to the atria, may contribute to atrial fibrillation. Direct thrombin inhibitor — A type of anticoagulant medication that works on a different stage of the clotting process than vitamin K antagonists or factor Xa inhibitors. Direct thrombin inhibitors work by preventing a protein in the blood, called thrombin, from causing clots to form. Dabigatran (Pradaxa) is a direct thrombin inhibitor drug. Double blind study — A trial in which neither the participants nor the investigators know whether they are in the study's experimental group or control group. Duty-cycled RF — Where catheters cycle the radiofrequency energy on and off to allow tissue to cool and prevent char formation during catheter ablation. Echocardiogram — A non-invasive diagnostic test that uses ultrasound waves to create an image of the heart. A gel is often applied to the patient's chest, and a technician moves a hand-held scanner (transducer) over the patient's heart. Ectopic foci — Sites within the heart that initiate abnormal heart beats. Edoxaban — An anticoagulant medication that is a factor Xa inhibitor. Edoxaban works by a different method from warfarin and, if approved for atrial fibrillation stroke prevention, will offer another alternative to warfarin. Efficacy — A medical term for effectiveness. Ejection Fraction — A measurement used to determine how well the heart is pumping out blood during each beat. For more information on what ejection fraction tests measure and how the tests are used, see Ejection fraction: What does it measure? from the Mayo Clinic and Ejection Fraction Heart Failure Measurement from the American Heart Association. Electrical cardioversion — A process to treat irregular heart rhythm by administering an electrical shock to the heart to restore or convert the heartbeat back to normal sinus rhythm. Electrical conduction — The way electricity is conducted within the heart. Electroanatomic mapping system — A system that allows doctors to visualize structures in 3D and create appropriate lesions, particularly with the incorporation of previously-acquired magnetic resonance (MR) or computed tomography (CT) images. It also reduces fluoroscopy exposure to doctors and patients. Also called multi-modality mapping or image integration systems. To learn more, see Electroanatomic Mapping Systems. Electrocardiogram (ECG or EKG) — A non-invasive diagnostic test during which electrodes are connected to a patient's torso and electrical activity in the heart is recorded. It is painless and takes only a few minutes as you lie down for the test to be administered. You must be undergoing an episode of afib at the time of the EKG in order for it to be seen on the readout, which works best for patients in persistent or longstanding persistent atrial fibrillation. If afib episodes are intermittent, as with paroxysmal atrial fibrillation, then they most likely will not be recorded on the ECG and wearing a Holter monitor may be necessary to detect afib. Electrodes — Small discs that transmit radiofrequency energy to tissue. Electrodes are used on some new ablation catheters. Electrogram — A tracing of electrical potentials of the heart created by electrodes being placed directly in the heart instead of on the surface of the body. Electrophysiologist (EP) — A specialized cardiologist who focuses on the electrical system of the heart and deals with irregular heartbeats (arrhythmias) such as atrial fibrillation. Catheter ablations are done by electrophysiologists. Electrophysiology (EP) lab — Similar to an operating room for a surgeon, an EP lab is where an electrophysiologist performs procedures, such as atrial fibrillation ablation. The sterile room has a patient bed and typically has many monitors, as electrophysiologists use many imaging software systems during procedures. Energy source — The energy used to create a lesion of scar tissue that stops the erratic electrical signals from traveling through the heart. Some typical energy sources used for atrial fibrillation procedures include radiofrequency energy, cryothermy, and laser energy. Endoscope — A miniature camera that allows visualizing of the area to be ablated. Endpoint — A goal of a procedure or a target result in a clinical trial. Epicardium — The inner layer of the pericardium that surrounds the heart. To learn more, see: Epicardium. Esophagus — The esophagus is the organ that begins at the top of the throat and extends to the stomach. It is the conduit through which food and beverages reach the stomach after swallowing. It is located behind the heart in the chest cavity. Esophageal fistula — A rare but often fatal complication of catheter ablation. Since the esophagus is located behind the heart, heat used to ablate heart tissue can inadvertently heat the esophagus, creating a fistula (or opening) in the esophagus. Whether an esophageal fistula has been inadvertently created is typically unknown at the completion of the procedure. Symptoms may not appear for two to four weeks after the procedure. If untreated, esophageal fistula can lead to septic shock and death. Event monitor — A small portable recorder that the patient normally wears attached to a belt or around the neck that records mobile electrocardiograms to detect the heart's electrical activity. The patient presses a button, or the device activates itself, when an afib episode begins. If afib episodes are so sporadic or infrequent that they are not captured on an EKG or Holter monitor, then an event monitor may be used to confirm atrial fibrillation. Factor Xa inhibitor — A type of anticoagulant medication that works on a different stage of the clotting process than vitamin K antagonists or direct thrombin inhibitors. Factor Xa (pronounced 10a) inhibitors decrease the incidence of blood clots by inhibiting a clotting factor called Xa that is needed to convert fibrinogen to fibrin, the major component of blood clots. Drugs in this class, also called direct factor Xa inhibitors, include apixaban (Eliquis), rivaroxaban (Xarelto), and edoxaban. For a video for clinicians explaining how factor Xa works, see: Factor Xa Inhibition Mode of Action. Feasibility study — In the United States, before a large trial can be conducted to evaluate the effectiveness of a drug or device, manufacturers must first prove that the drug or device is safe. Feasibility studies typically enroll 50 or fewer people. If results suggest that the treatment is safe, the drug or device would then proceed to a pivotal trial. Fibrin — Fibrin is an essential part of blood clot formation. Fibrin is created when two proteins in the blood, fibrinogen and thrombin, interact to create a fibrous network that traps blood cells, forming a clot. The new anticoagulants work by disrupting the creation of either fibrinogen (as factor Xa inhibitors do) or thrombin (as direct thrombin inhibitors do), ultimately disrupting the creation of fibrin's fibrous network for trapping blood cells. Fibrinogen — A blood protein that interacts with thrombin to form fibrin. Fibrosis — Scar tissue within the heart muscle that damages the underlying organ or tissue; also, abnormal thickening and stiffening of heart valves and muscle tissue. To learn more about the link between stroke and fibrosis caused by atrial fibrillation, see New Research Yields Insight into Stroke Mechanism for Atrial Fibrillation Patients. Fluoroscopy — An imaging technology that uses X-rays to provide real-time video of the heart during closed-chest procedures. It is the most frequently used imaging technology to help guide catheter ablation procedures. The images are two dimensional (flat) and are in black and white. During fluoroscopy, a catheter is inserted in the groin and threaded through the vessels to reach the heart. Ganglionated (or ganglionic) plexi (GPs) — These are "fat pads" in the heart that contain nerves that control automatic functions, such as breathing. These nerves also initiate electrical activity at various places in the heart, and when one ganglionated plexus (singular version of plexi) is activated, it is thought that another nearby will also be activated. Ganglionated plexi ablation — Ablating the ganglionated plexi is an advanced strategy for stopping afib. Some doctors use mapping catheters with high frequency electrodes to identify ganglionated plexi, while others simply ablate the four primary ganglionated plexi in the left atrium. Ablation of the ganglionated plexi has not been widely adopted by electrophysiologists, which may be because there is little research data available. Helicobacter pylori (H. pylori) — A type of bacteria that infects the stomach and is often associated with ulcers. Research published in 2005 suggested a possible link between H. pylori and atrial fibrillation, but subsequent studies have not confirmed that finding and in fact reported no correlation. Hemorrhagic stroke — A stroke caused by bleeding in the brain. Approximately 13% of strokes are hemorrhagic (bleeding) strokes. See also intracranial hemorrhage. High blood pressure — A condition in which blood pumps through arteries in the body harder than normal, exerting greater force against the arteries. Doctors refer to this condition as hypertension. It is a factor included in the CHADS2 scoring tool as conveying increased stroke risk for those with atrial fibrillation. To learn more, see High Blood Pressure. Holter monitor — A small portable recorder that the patient normally wears attached to a belt or around the neck that records mobile electrocardiograms to detect the heart's electrical activity. They can typically record for 24-hours, 48-hours, or seven days, and patients normally wear Holter monitors for 24–48 hours. If afib episodes are so sporadic or infrequent that it's unlikely that they will be captured on an EKG or Holter monitor, then an event monitor, which you activate or that activates by itself when an episode occurs, may be used to confirm atrial fibrillation. Hybrid ablation — A procedure done as a collaboration between electrophysiologists and surgeons that combines in the same operation the best of catheter ablation, done on the inside the heart, and the mini maze procedure, done on the outside of the heart. This treatment, which is typically for patients with persistent and longstanding persistent afib, improves the chances of the ablation lines being transmural. Though not yet proven, higher success rates and fewer complications could be possible because each specialty ablates areas of the heart best suited to their different approaches. Hybrid procedure — See hybrid ablation. Hypertension — See High blood pressure. Hyperthyroidism — A condition in which an overactive thyroid gland produces too much thyroid hormone, which can cause weight loss, rapid and irregular heart rate, and sensitivity to heat. See also: Thyroid disease. Hypothyroidism — A condition in which an underactive thyroid gland doesn't produce enough thyroid hormone, which can cause weight gain, fatigue, and sensitivity to cold. See also: Thyroid disease. Implantable cardiac defibrillator (ICD) — An implantable cardiac defibrillator is implanted in patients who are at risk for Sudden Cardiac Death. Image integration systems — See electroanatomic mapping systems. Implantable loop recorder — A small device implanted under the skin in the chest area to record the heart's electrical rhythms. International Normalized Ratio (INR) — Tests that determine if warfarin or Coumadin are working correctly. A normal INR for someone in afib is 2.0-3.0, though those with mechanical valves should follow doctor instructions as to the appropriate INR for them. INR tests are sometimes called Prothrombin Time (PT) tests. Intracardiac echocardiography (ICE) — A procedure that provides real time ultrasound images of the anatomy to facilitate the transseptal puncture (from the right atrium to the left atrium) and to guide catheter ablation. Intracranial hemorrhage — Bleeding in the brain or elsewhere in the skull. Causes of intracranial hemorrhage include head injury, ruptured aneurysm, hemorrhagic stroke, anticoagulant medications, and blood clotting disorders. Irrigated radiofrequency energy catheters (cooled RF) — A single point catheter with tiny holes at the tip that spread cooled water, usually a saline solution, to the ablation area to allow the electrophysiologist to deliver high levels of radiofrequency energy while moderating the temperature where the catheter connects with heart tissue. Ischemic stroke — A stroke that occurs when blood flow to the brain is blocked by a clot or other obstruction. An ischemic stroke typically occurs when a blood clot from elsewhere in the body travels to the brain, blocking the blood flow and oxygen supply to part of the brain and causing brain cells in that region to die. Ischemic strokes are the most common type of strokes - approximately 87% of all strokes are ischemic strokes. Isolated — A state where the pulmonary veins no longer conduct the erratic electrical signals through the heart. Lacunar (stroke) — A type of stroke that is typically caused by a small clot that blocks a small branch of a larger blood vessel and usually affects deeper regions of the brain. Laser energy — Light waves that are converted to heat energy to ablate, or create a lesion of scar tissue, to stop the erratic electrical signals from traveling through the heart. Learning curve — Refers to the "learning" that doctors acquire as they perform procedures. In general, the more procedures that a doctor performs, the better the outcomes (in terms of safety and efficacy) and the faster the procedure, as the doctor learns from earlier procedures what to do and what not to do. In medical devices, the learning curve is measured in terms of how many cases or procedures a doctor needs to perform in order to become proficient with the device or technology. Left atrial appendage — A pouch or sac on the left atrium of the heart that is the source of the clots that cause most afib-related strokes. Left ventricular dysfunction — Refers to when the left ventricle doesn't work properly. Left ventricular dysfunction is a component of heart failure. Longitudinal study — A study in which researchers observe and collect data on the same people over a long period of time. Macro re-entry sites — These are new pathways that are created that can allow afib to cycle in the heart. Macro re-entry sites are different for each patient. Magnetic resonance imaging (MRI) — A non-invasive diagnostic test that uses a magnetic field and radiofrequency waves to create images of organs and vessels. MRI provides more detailed images than Computed Tomography (CT), but is more expensive. Patients with pacemakers or implantable cardiac defibrillators (ICDs) may not be permitted to have MRI scans. Mapping catheter — Catheter used to determine whether there is electrical activity, called "potentials," around the pulmonary veins. These are areas that could serve as a trigger or macro re-entry site for atrial fibrillation. Mini maze procedure — A minimally-invasive surgical ablation that uses an energy source to scar the tissue. It doesn't require opening the chest, so it has a shorter recovery time. It is less invasive than the other surgery options, and is slightly more invasive than catheter ablation. To learn more, see Mini Maze Procedure. Mini-thoracotomy — A 2- to 3-inch incision between the ribs for performing minimally-invasive surgery. This is less invasive than a sternotomy. Mitral isthmus — The area where the mitral valve and the left inferior pulmonary vein meet. Mitral valve — The heart valve connecting the left atrium and the left ventricle. When the left atrium contracts, the mitral valve opens and allows blood to flow into the left ventricle. When the left atrium relaxes, the mitral valve closes. Mixed sleep apnea — A combination of obstructive sleep apnea and central sleep apnea, which are breathing disorders that can increase arrhythmia risk. Monopolar energy source — Energy that is transmitted from a single point. Morbidity — Disease, or a state of illness. When studies refer to "morbidity and mortality" statistics, they are talking about cases of disease and death. Mortality — A measurement of the number of deaths in a population over a certain amount of time. Multielectrode circumferential mapping catheter — Catheter used to verify that the pulmonary veins are electrically isolated during catheter ablation. Multielectrode radiofrequency catheters — These ablation catheters have several electrodes, each of which can transmit radiofrequency energy, and can ablate a larger area of tissue than single point radiofrequency energy catheters. They can enable the use of bipolar radiofrequency energy, which may reduce complications that are seen with unipolar radiofrequency energy. Multi-modality mapping — See electroanatomic mapping systems. Multipolar energy source — Energy that is transmitted from multiple points. Neurological deficits — Problems with normal activities, such as speech or walking, often due to a stroke or transient ischemic attack (TIA). Non-steroidal anti-inflammatory drugs (NSAIDs) — Drugs that provide anti-inflammatory (inflammation-reducing) or fever-reducing effects. NSAID drugs include prescription medicines such as COX-2 inhibitors and over-the-counter medications such as aspirin and ibuprofen. Anyone who takes an anticoagulant drug (blood thinner) should consult a physician before using an NSAID or other prescription or over-the-counter medication because one may affect how the other works. For a list of some common medicines that may interact with blood thinner drugs, see Blood Thinner Pills: Your Guide to Using Them Safely from the Agency for Healthcare Research and Quality. Nonvalvular atrial fibrillation — Atrial fibrillation that is not caused by underlying heart valve disease or issues. Obstructive sleep apnea — A condition in which the airway is blocked during sleep, interrupting or stopping breathing. For more information, see: Obstructive Sleep Apnea. See Sleep Apnea for other forms of sleep apnea. Ostia — The openings of the pulmonary veins. The singular form is ostium. Ostial Pulmonary Vein Isolation — See Segmental Pulmonary Vein Isolation. Oversampling — A method researchers use to analyze study data that allows them to focus on specific things that they want to compare or contrast, such as age, disease, race, region, or other factors. Oversampling may be used when it is not possible or practical to compare equal numbers or matched groups by random matching. Pace — The process of placing probes, which emit electricity, against cardiac tissue to stimulate nerves and/or electrical impulses. Pacemaker — A medical device implanted under the skin in the chest area. A wire lead is connected from the pacemaker to the patient's heart. A pacemaker is sometimes necessary if the electrical impulses in a patient's heart are too slow. Pacemakers do not treat atrial fibrillation. However, some patients after having afib surgery may require a permanent pacemaker. Palpitations — A feeling that the heart is pounding, thumping, or racing. Palpitations can range from being merely annoying to being painful. For more information, see: Heart palpitations. Paroxysmal atrial fibrillation — Atrial fibrillation episodes that come and go and last seven days or less. This is sometimes referred to as intermittent afib. This classification is spelled out in the 2014 AHA/ACC/HRS Guidelines for the Management of Patients with Atrial Fibrillation . Pathophysiology — A branch of medicine that focuses on the disturbances or functional changes of the body caused by disease. Pericardium — The tissue that surrounds the heart, and is also called the pericardial sac. To learn more, see: pericardium. Permanent atrial fibrillation — Continuous atrial fibrillation in which a decision has been made by the patient and the doctor not to try to restore normal sinus rhythm by any means, including catheter or surgical ablation. This classification is spelled out in the 2014 AHA/ACC/HRS Guidelines for the Management of Patients with Atrial Fibrillation. Persistent atrial fibrillation — Continuous atrial fibrillation that lasts more than seven days. This classification is spelled out in the 2014 AHA/ACC/HRS Guidelines for the Management of Patients with Atrial Fibrillation. Phased RF — Ability to automatically turn on and off radiofrequency energy to allow tissue to cool to avoid overheating and charring of tissue. Phrenic nerve — The nerve that automatically prompts the diaphragm to expand and constrict during normal breathing. It is located near the pulmonary veins. Phrenic nerve injury is a potential complication of catheter ablation and makes normal breathing difficult. Pivotal trial — A clinical trial that evaluates efficacy and safety of a drug or device in a large group of people, often at several centers. Results from a pivotal trial are submitted to the Food & Drug Administration (FDA) to support FDA approval for the treatment. Pivotal trials for investigative drugs are usually randomized, so that a patient may receive the experimental drug or an already-approved FDA drug or placebo. In a medical device pivotal trial, patients may or may not be randomized. In recent ablation catheter pivotal trials, patients were randomized to either receive treatment by the ablation catheter or by an antiarrhythmic medication. Population-based study — A population-based study is one that focuses on a group of people and follows those individuals over time. For more information, see: Population-based Cohort Studies. Post-bypass afib — New onset of atrial fibrillation after heart bypass surgery. Posterior — The back wall of the heart. Potentials — Areas that could serve as a trigger or macro re-entry site for atrial fibrillation. Prospective study — A research study in which a group of people known to have one or more factors in common is followed over a period of time and monitored or checked periodically to see whether and/or how various things in their lives may affect health, longevity, or other criteria. One example of a large prospective study is The Nurses' Health Study. Pulmonary embolism — A blood clot in a lung. For more information, see: Pulmonary Embolism. Pulmonary vein ablation — See Antrum pulmonary vein ablation. Pulmonary veins — The veins that connect the lungs to the left atrium. See them in this diagram of the heart. Pulmonary vein antrum isolation (PVAI) — This type of catheter ablation involves lesion lines in the antrum of the pulmonary veins, and doctors confirm that conduction block has been achieved. It may include additional lesion lines in the superior vena cava, roof of the atrium, or the septum, but these vary by doctor and there isn't a standard set of lesion lines. Pulmonary vein isolation (PVI) — Ablation of the area around the pulmonary veins to block electrical impulses that stop atrial fibrillation from perpetuating in the heart. Also called pulmonary vein antrum isolation (PVAI). The first Pulmonary Vein Isolation procedures ablated tissue in the ostia (opening) of the veins. Ostial Pulmonary Vein Isolation, also called Segmental Pulmonary Vein Isolation, led to a high incidence of pulmonary vein stenosis (narrowing of the veins). As a result, PVI or PVAI, ablation performed on the outer area of the veins, is mostly performed today. Pulmonary vein ostium — The opening to the pulmonary veins. Pulmonary vein stenosis — A significant narrowing of the pulmonary veins that can result from catheter ablation. This is a serious complication that can obstruct oxygenated blood from flowing from the lungs into the heart. Pulmonary vein venography — A procedure that helps determine the location of the pulmonary vein ostia, the base of the pulmonary veins, and guides the manipulation of the catheter. P-value — A statistical term to express the relationship between variables that might affect clinical results in a randomized trial. For instance, if the treatment group had significantly more persistent afib patients than the control arm, the p-value would be high, signifying that the higher number of persistent patients could affect the overall efficacy rate seen in the trial. For a heart-related explanation and example of how p-value is used in studies, see What is a P-value?. Radiofrequency energy — Radio waves that are converted to heat energy to ablate, or create a lesion of scar tissue, to stop the erratic electrical signals from traveling through the heart. RE-LY Trial — An international study of more than 18,000 people with nonvalvular atrial fibrillation that compared dabigatran to warfarin to see which drug was more effective at stopping ischemic and hemorrhagic strokes. For more information, see Dabigatran Better than Warfarin for Stroke Prevention in Atrial Fibrillation. Rivaroxaban — An anticoagulant medication that is a factor Xa inhibitor. Because rivaroxaban (brand name Xarelto) works by a different method than warfarin, it offers an alternative to warfarin for those who have nonvalvular atrial fibrillation. It was the first once-a-day alternative to warfarin to be approved in the US. For more information, see: Xarelto Approved by the FDA for Atrial Fibrillation Stroke Prevention. ROCKET-AF Trial — A large international study comparing the effectiveness of rivaroxaban and warfarin for stroke prevention in people with nonvalvular atrial fibrillation. For more information, see: Rivaroxaban as Effective as Warfarin for Stroke Prevention in Atrial Fibrillation. Rotor — Small rotating electrical sources within the atrium of the heart that are like spinning tops and drive atrial fibrillation. Segmental Pulmonary Vein Isolation — The first pulmonary vein isolation procedure, which was performed by Michel Haïssaguerre, MD, and colleagues. Ablation was performed in the ostia (opening) of the pulmonary veins. However, a high incidence of pulmonary vein stenosis (narrowing of the pulmonary vein) occurred, which led to other techniques outside and around the pulmonary veins. Also called Ostial Pulmonary Vein Isolation. Septal wall — The wall between the left and right atria. Sequential ablation — See stepwise ablation. Silent brain infarcts — Areas of the brain that are cut off from blood supply and oxygen but do not result in noticeable neurocognitive impairment. Those who have silent brain infarcts have a higher risk of getting dementia or experiencing cognitive decline. Single point radiofrequency catheter — An ablation catheter that emits radiofrequency energy from a single point at the catheter tip. Sinoatrial node (SA node) — The heart's natural pacemaker. For more information, see this diagram of the heart. Sleep apnea — A disorder that disrupts breathing during sleep and increases the risk of having arrhythmias. There are three types of sleep apnea: obstructive sleep apnea, central sleep apnea, and mixed sleep apnea. Sleep apnea has been reported to be present in up to half of those with atrial fibrillation. To learn more, see Sleep Apnea Multiplies Risk of Arrhythmias Like Atrial Fibrillation. Statins — Drugs used to lower the levels of blood cholesterol. Statin drugs include atorvastatin (Lipitor), simvastatin (Zocor), lovastatin (Mevacor), rosuvastatin (Crestor), and others. Steam pops — A potential complication of irrigated radiofrequency ablation catheters, which use water or a saline solution to cool the temperature of the tissue at the ablation site. The high temperature created by radiofrequency energy can cause water inside of tissue to boil. Sometimes so much steam builds up that it bursts through the tissue. Steam pops look like craters and can lead to cardiac perforation. Stepwise ablation — This catheter ablation strategy, which is the only one with a stated goal of terminating afib, involves isolating the pulmonary veins and making additional lesion lines, such as the roof of the left atrium, the coronary sinus, or the mitral isthmus, and then checking for conduction block after each. This is sometimes called sequential ablation because the additional lesion lines are often performed in the doctor's own specified order. Sternum — The breastbone, which is split to allow access to the heart for an open-chest procedure. Sternotomy — An incision that splits the sternum in order to do an open-chest procedure. Steroids — A term that encompasses medications such as prednisone and other corticosteroid drugs. Steroids may be prescribed to treat rheumatoid arthritis, asthma, some cancers, and other conditions. STOP AF clinical trial — The STOP AF (Sustained Treatment of Paroxysmal Atrial Fibrillation) clinical trial showed that a learning curve impacted cryoablation success in treating paroxysmal atrial fibrillation. For more information, see: Study Shows Cryoablation Beats Rhythm Medicines for Paroxysmal Atrial Fibrillation. Stroke — A disruption of blood flow to the brain that deprives the brain of oxygen. Without oxygen, brain cells can die, causing permanent disability in the affected parts of the brain. Strokes that occur when the brain's blood supply is blocked by a clot are ischemic or lacunar, and strokes that are caused by bleeding in the brain are hemorrhagic. For more information about strokes, see Stroke Risks from Afib. Stroke belt — The stroke belt is an eleven-state area in the southeastern United States where stroke death rates are higher than other states. In the 1980s, the National Heart, Lung, and Blood Institute (NHLBI) found that stroke deaths in the stroke belt were 10% higher than the US average. The stroke belt states are identified by the NHLBI as Alabama, Arkansas, Georgia, Indiana, Kentucky, Louisiana, Mississippi, North Carolina, South Carolina, Tennessee and Virginia. For more information, see: Stroke Belt Initiative and Evaluation of Social Status as a Contributing Factor to the Stroke Belt Region of the United States. Stroke buckle — A three-state area within the stroke belt where stroke deaths are highest. The stroke buckle states are North Carolina, South Carolina and Georgia. Substrate — The deeper layers of heart tissue. Substrate modification — See atrial remodeling. Superior vena cava — The vessel that transports de-oxygenated blood from the body back to the right atrium of the heart. See it in this diagram of the heart. Symptomatic — Atrial fibrillation that the patient feels or recognizes. Thrombin — A protein in the blood that causes clots to form. Thromboembolism — A thrombus (clot) that breaks free from the site where it formed and travels in the bloodstream through the body. These clots can cause a stroke, heart attack, or pulmonary embolism, and other problems. Thrombus — A clot that forms inside the body when blood flow is slowed or stopped long enough to allow coagulation, such as when blood entering the left atrial appendage of the heart is caught on the rough edges inside the appendage. If a clot breaks loose, it can travel through the bloodstream to the heart, where it can cause a heart attack, or to the brain, where it can cause a stroke. Clots may also form during medical procedures such as catheter ablations when heat-based energy used in the ablation results in charred blood or tissue entering the blood stream, with the same result. Thyroid disease — A condition in which the thyroid gland does not perform normally. The two primary types are hypothyroidism and hyperthyroidism. To learn more about the thyroid, see Thyroid Function Tests. Time in therapeutic range — A term that refers to the percentage of time that someone on anticoagulants has an International Normalized Ratio (INR) within the 2.0 to 3.0 normal range for those with atrial fibrillation. Transesophogeal echocardiogram (TEE) — An invasive imaging test that uses ultrasound waves to create images of the heart. A small tube with a miniature scanner ("transducer") is inserted into the patient's mouth and guided into the esophagus. The transducer emits sound waves toward the heart and records the sound waves that are "reflected" off the heart to create images. It is often used prior to a procedure, such as a cardioversion, catheter ablation, or surgery, to determine if there are any blood clots in the heart. Transient ischemic attacks (TIAs) — Often called "mini-strokes", they are considered to be warning strokes as a blood clot temporarily blocks an artery. TIAs usually last no more than five minutes, and may only last for seconds. They leave no permanent damage. Those who have had a TIA are much more likely to have a stroke. One-third of those who have had a TIA will have a stroke, often within a year. For more information about TIAs and strokes, see Stroke Risks from Afib. Transmural lesion — An ablation line that fully penetrates the inner and outer layers of cardiac tissue and prevents chaotic electrical activity from circulating in the heart. Transmurality — When a lesion has fully penetrated the inner and outer layers of cardiac tissue it is known as transmural, which creates a conduction block that prevents afib from circulating in the heart. Trigger — An anatomic area, such as the pulmonary veins, that emits electrical impulses that initiate atrial fibrillation. Also, as a secondary definition, there are various things that are referred to in the patient community as triggers because they start an afib episode. 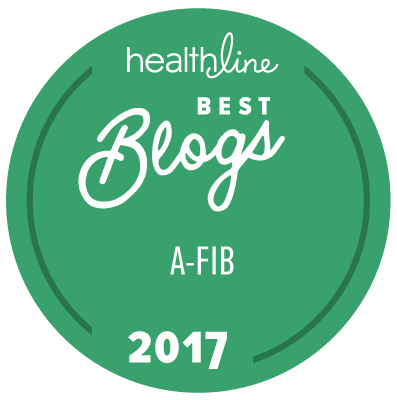 Foods, alcohol, stress, and many other things are commonly considered as triggers within the afib patient community. Unipolar radiofrequency energy — Unipolar is radiofrequency energy that is transmitted from a single point at the catheter's tip. Vitamin K antagonist — An anticoagulant medication that works by blocking vitamin K, which is necessary for blood clot formation. Warfarin (Coumadin) is a vitamin K antagonist. Warfarin — An anticoagulant medication that is a Vitamin K antagonist. Warfarin (brand name Coumadin) is informally referred to as a blood thinner. Wavelength — The heart's natural "electricity system" emits energy at varying lengths and speeds. Wavelength is one attribute electrophysiologists evaluate in order to diagnose and treat arrhythmias.